Tequila in one form or another has been made for hundreds of years. Almost back to the time of Christ, the Aztecs and other Central American Indians produced a fermented beverage called pulque from native agave plants. When the Spanish arrived in the 16th century, they brought the knowledge of distillation. Along with all the harm the Spanish did to the native civilizations, they did do one enlightened thing--they applied distillation to the local pulque and produced the first Tequilas. How do you make Tequila? According to Mexican regulations, Tequila is made only from the Blue Weber species of the agave plant. These plants are mostly grown in and around the town of Tequila which is in the state of Jalisco, Mexico. A few other distilleries make Tequila outside of Jalisco. 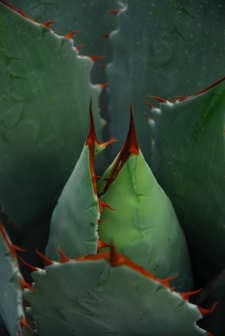 Tequila's cousin, Mezcal, may be made from other species of the agave plant besides Blue Weber. This makes Tequila a form of Mezcal, and all Tequilas are technically Mezcals. But all Mezcals are not Tequila. It takes 8 to 12 years for an agave plant to mature before it is ready to be harvested. Harvesting consists of stripping the plant of its flowers and cutting out the juicy core or heart. This is called the pina and resembles a roughly hewn giant pineapple. These hearts of the agave plant can range in size from 60 to many hundreds of pounds. The pina is split and baked in a steam oven in order to convert the starches present in the agave into simpler, fermentable sugars. The baked agave is then shredded and strained to extract the juice. This juice is fermented to produce agave wort or mosho that is about 5% alcohol. The wort is then distilled twice in pot still to about 50 to 60% alcohol by volume. A few manufactures distill their Tequila a third time. Pot stills are predominantly used in Tequila production while column stills are rare. After distillation, the result is a clear spirit that is eventually cut down to 36 to 43% alcohol with water. A few distilleries do not cut their Tequila with water and instead distill only to 40% so that water is not necessary. Some raw Tequila is then aged in stainless steel tanks or oak barrels. The agave base spirit is not suitable for many years of aging like whiskeys or brandies. If aged too long, the oak will impart overtones that overwhelm the fresh, vegetal flavors of the agave spirit that comes from the still. 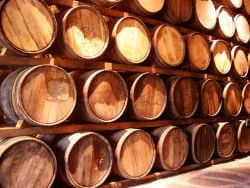 Therefore, the oldest Tequilas are usually aged no more than five or six years, with most receiving between a few months to a few years of aging. New oak barrels are used, but there is also a profusion of used bourbon barrels and used sherry barrels. New oak barrels will impart the oak overtones more quickly to the delicate agave spirit, hence the popularity of using used oak barrels. You can often detect bourbon notes in Tequilas that have been aged in barrels previously used to age bourbon. Some Tequilas such as Sauza Hornitos are aged in massive beech wood lined tanks. Before bottling, some mixto (see below) Tequilas receive caramel or molasses based coloring to give them a golden hue. Also, if the Tequila is a mitxo, the 100% agave spirit will be blended with other spirits (usually rum or neutral spirits). This blending can occur earlier during the fermentation stage where sugar is introduced into the agave wort. Some Tequila is shipped out of Mexico in bulk and bottled in the destination country. In 2006, Mexico tried to put a halt to this practice by insisting that all Tequila be bottled in Mexico. Their rationale was that this would guarantee the quality of the product, but other countries protested that Mexico just wanted all the bottling business for itself. A compromised was reached allowing bulk shipments out of Mexico and bottling in the registered bottling plants in other countries. Mixto Mixto Tequila (Spanish for mixed) are Tequilas that have added sugar-based spirits (basically rum) along with the agave spirit. 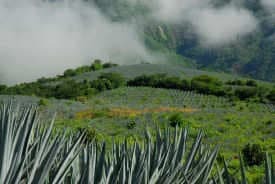 Because of the long growing times of the agave plant, producing Tequila solely from agave is expensive. In order to market a less expensive and more palatable (to some international tastes) product, up to 49% sugar-based spirit is allowed in mixto Tequila. You won't see the word mixto on the label--mixto Tequilas are just labeled as Tequila. If you don't see a reference to 100% agave, it's a mixto. Two thirds of all Tequila are mixtos, and most of them go into making margaritas. Some producers are now offering higher quality mixtos in blanco, reposado, and anejo grades. These Tequilas, while sometimes superior to the lower quality mixtos, can't compete with 100% agave Tequilas in fresh, authentic agave flavor and complexity. 100% Agave Tequila produced only from the juice of the Blue Weber agave plant is called 100% agave Tequila. This Tequila is not blended with cheaper sugar or grain-based spirits. It retains all of the agave character with no dilution from blander spirits. These Tequilas can offer an extraordinary range of aromas, flavors, and complexity. Blanco Also called silver or platinum, blanco Tequila is aged briefly in stainless steel tanks before bottling. It is clear in color and because there is no contact with oak, the fresh, fleshy, agave flavor is preserved. Blancos are usually the least expensive 100% agave Tequilas and provide a great opportunity if you want to try to move beyond mixtos. 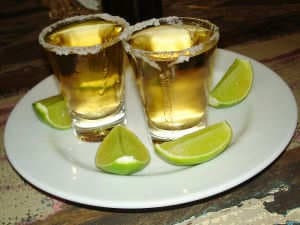 You will find blancos in top shelf margaritas and also in Tequila shots if you're willing to spend a little more money. Reposado The next step up is resposado or rested Tequila. Reposado is aged between 2 months and 1 year on oak or other woods such as beach wood. This yields a middle ground between the fresh agave flavor and complex oak structure. With a reposado, you usually get both--you still have a reasonable amount of the vegetal agave along with a dose of spice, vanilla, and backbone from the wood. Anejo At the top is anejo or aged Tequila, which is aged a minimum of one year and often is aged two or three years. Anejo takes on more flavor, aromas, and character from the wood making for a smoother, supple Tequila. The amount of oaky notes varies with some producers going just a little beyond reposado and some going whole hog into bourbon territory (ie 5+ years on oak). Anejo is usually the most expensive of the three. There is a class of Tequila called Extra Anejo that is new to the scene. This is just anejo that has been aged longer than usual--sometimes six to ten years. There are not many of these Tequilas and they usually cost several hundred dollars per bottle. You will also see smattering of Tequilas from producers that hover around the $100 per bottle price point. These are usually full bodied, incredibly complex anejo Tequilas with intense aromas and flavors, some of which you wouldn't expect to find in a Tequila. Examples include Don Julio 1942, El Tesoro Paradiso, and Cuervo Reserva de la Famila. From a tasting perspective, you can look at Tequilas for margaritas and Tequilas for sipping. In the margarita category, you have solid mixtos like El Jimador or lower end 100% agave Tequilas like Sauza Hornitos. Some blanco 100% agaves are worth making margarita with as long as you use fresh lime juice and Cointreau or Grand Marnier--skip the prebottled margarita mix. When you start getting into more expensive 100% agave reposados and anejos, the other ingredients in the margarita tend to overwhelm the Tequila unless you really strip down the margarita and start to think of it as a cocktail in an up glass. For sipping, you just need to find what suits you. Everyone has different tastes and preferences and with Tequila, it's no different. Do you like the raw, peppery agave blancos? Try El Tesoro Platinum. Tesoro distills their Tequila to 80 proof and doesn't need to cut it with water. This concentrates the agave flavors a makes for an intense blanco. If you want a little smoothness, spice, and a touch of vanilla, you may want to look at a reposado--perhaps an Espolon reposado. Espolon reposado strikes a nice balance between the prickly blancos and regal anejos. Perhaps you like your spirits to have a big, complex profile? A Scotch, bourbon, or cognac drinker? 100% agave anejo Tequila might be your preference. You get the rich oak you're used to with some agave fruit peeking out. A good choice would be Herradura anejo--this Tequila sits on new white oak for 25 months giving it ample oak structure along with vanilla, cinnamon, and caramel notes.